Bye Bye Carbs! 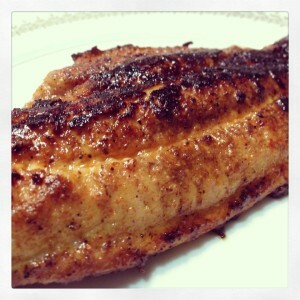 Blackened Catfish | Just Cuc It! Josh and I decided we really needed to start eating better and losing some of this happy relationship weight that has inched its way into our britches! Last night I pan-fried catfish for our inaugural Lo-Carb supper! Blackened Catfish is pretty easy! You can usually find fresh, farm-raised catfish in the grocer’s fish market (HEB). . . I bought 3 fillets (for myself, Josh and Jonah). Jonah skipped out on us to meet friends at Myako’s for there very awesome sushi happy hour! Here is the recipe for 3 servings. **I added a little water to the pan when it looked like it was charring or smoking, this created a more darker golden color on the fish! Squeeze some lemon on it and normally I would serve this with dirty or jasmine rice, but since we are not eating CARBS, we just had it by itself. 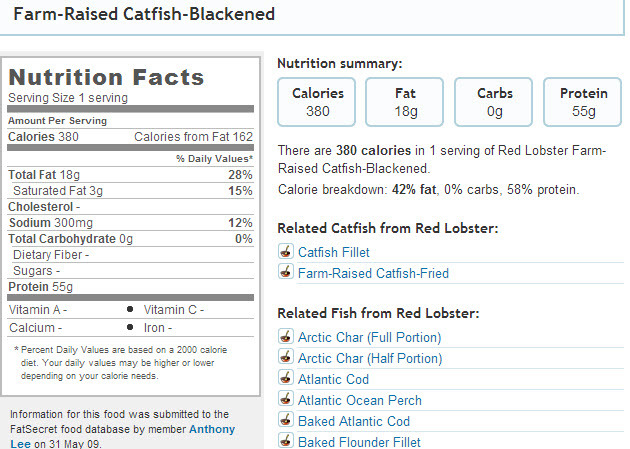 Here are the nutrition facts if you are curious.